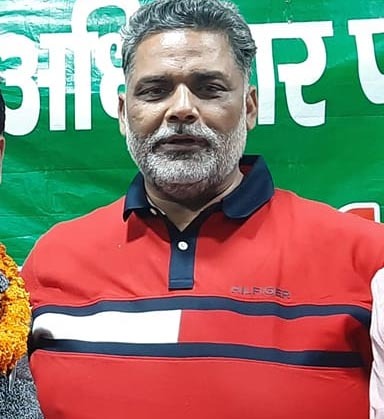 New Delhi, Mar 24: Bihar MP Pappu Yadav on Sunday expressed his wish to contest the Lok Sabha election on a Congress ticket. "If the Congress leadership wants my support then I will definitely join the party. It is important to save our country and humanity, and hence, all the people and the parties with the same ideology should join hands. The Congress leadership has to decide now," Rajesh Ranjan, who is popularly known as Pappu Yadav, told PTI. When asked if he would merge his Jan Adhikar Party with the Congress, Yadav said ideology surpasses everything. "In these circumstances when the country is in such a great crisis, whatever order the Congress leadership will give, we will follow." The Madhepura parliamentarian hit out at the Bharatiya Janata Party, saying the farmers and the youth were facing trouble and economic crisis and added that there was a need bring a change. Asked about his strategy if Sharad Yadav contests from Madhepura in the Lok Sabha election, Pappu Yadav said: "Whatever is necessary in the interest of coalition, I will do that." Pappu Yadav said he had no personal issues with anyone and there is no rivalry in politics. Asked whether there has been any talks of coalition with the RJD, Yadav said thought there has been no talks, he considers the RJD members as his family and Lalu Prasad Yadav as his elder brother. Significantly, Pappu Yadav had contested the 2014 Lok Sabha election on an RJD ticket. However, he was expelled from the party due to his differences with the leadership. Yadav's wife, Ranjit Ranjan, is a Congress MP from Supaul constituency.